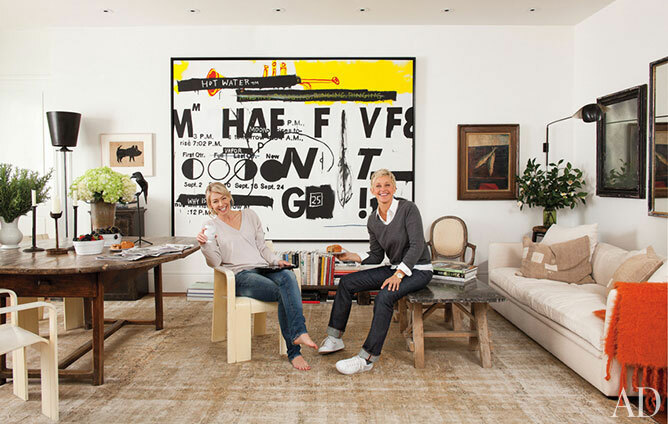 I'm loving the blend of earthy + modern elements that Ellen Degeneres and Portia de Rossi have used in their Beverly Hills home. 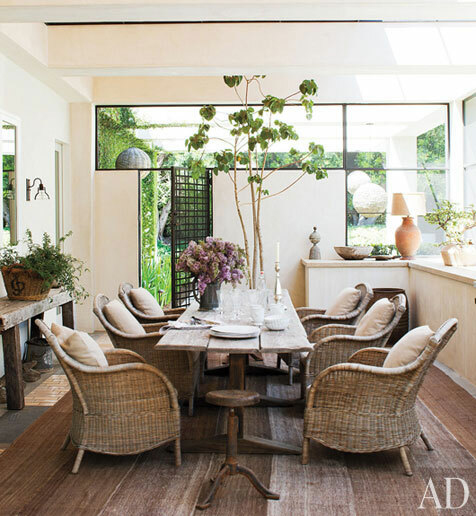 It's truly a textural and inviting retreat! And the grounds and pool? = Divine! These oversized sofas are amazing!! One Please!! a side note: I desperately am in need of a night to sit and blog surf with a large glass (emphasize large) of wine! I'm off to a client meeting now, so I hope I can squeeze in some down time later tonight!! I need some fresh sources and ideas and am always very inspired by all my fellow bloggers and designers!! It's a really interesting mix, hard to pull off, but this truly looks like they actually live here. In fact it looks like a lot of people would love to live here! It's so casual and inviting, yet stylish too. I can imagine just flopping down in one of those sofas with a good glass of wine and a great book, simply enjoying the atmosphere. And that setting for the pool....oooaahh! I spot another Serge Mouille fixture. I'm dying over this house. Love it. I LOVE this posting! I agree! It is always perfect when I can just sit with a big glass of wine and blog for an hour or even two! I loved what you said in your side note about getting recharged, it just seemed to hit a note with me. Love your blog - it's just all cool.